The Mallard pallet jack access ramp bridges the divide between floor-mounted pallet flow and the pallet jack. The pallet jack access ramp allows pallet jacks to be driven up to meet the elevation of a pallet flow lane in order to load or unload a pallet. Consider dock staging using pallet flow and a pallet jack vs bulk stacking and forklifts. 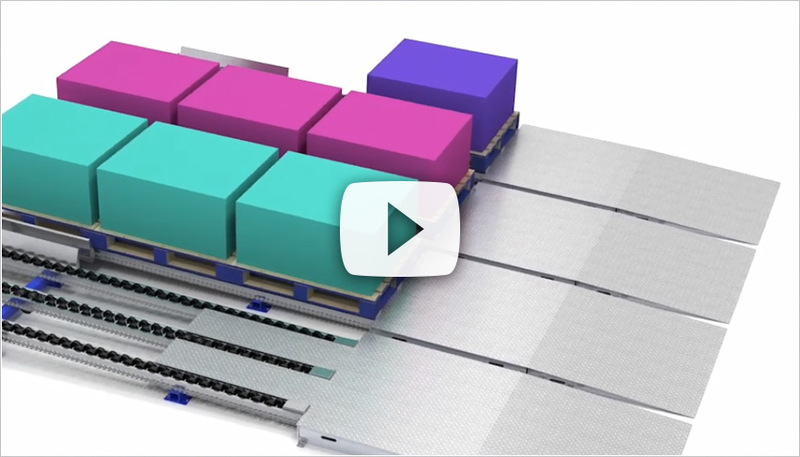 Pallet flow is simply a better tool than bulk stacking for optimizing floor space and managing inventory and processing costs. And the pallet jack is much more nimble, fast and affordable than a forklift. The combination of the two increases safety and efficiency while reducing costs at the dock. Pallet jack access ramps are a proprietary Mallard product. 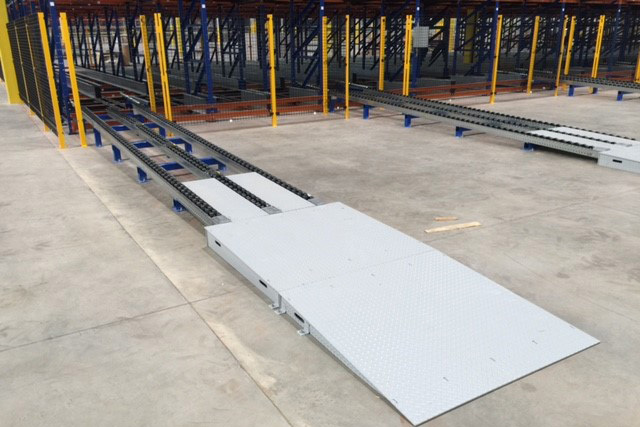 Ramps are manufactured using a heavy-duty galvanized material and then “textured” to provide a grip surface that prevents pallet jacks from accessing the pallet flow lane too quickly and providing the operator with protection against slipping while entering or extracting a pallet. Mallard pallet jack access ramps are customized to fit any Mallard floor-mounted pallet flow lane configurations. Our pallet flow products are available in wheeled or roller system configurations depending on the application and pallet specs. Floor-mounted pallet flow is installed using custom floor-mounted pallet flow supports designed for each specific type of pallet flow lane. Our products are manufactured to the highest quality for consistent, long term, dependable use in busy warehouse environments. If you’d like to learn more about our pallet flow products, accessories or applications check out our blogs (below) or give our Gravity Flow team of experts a call!